The only opposition candidate has withdrawn from Djibouti's presidential elections scheduled for next month. Mohamed Daoud Chehem told the BBC he took the decision because he had not raised enough funds for his campaign. Opposition parties have been calling for a boycott because, they say, they expect widespread vote-rigging. Although President Ismail Omar Guelleh is now the only candidate, the elections would be held as scheduled on 8 April, the interior minister said. The opposition denounced the 2003 parliamentary elections in which the government coalition won all 65 seats. Last month, the US criticised Djibouti's human rights record as "poor". 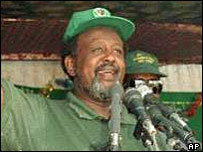 Mr Guelleh has ruled Djibouti since winning elections in 1999.